His Excellency Shri Ram Nath Kovind, Hon'ble President, India is the visitor of RLB Central Agricultural University. 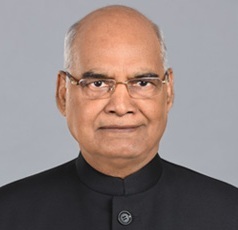 He assumed office as the 14th President of India on July 25, 2017,Before assuming charge of the office of the 14th President of India, Shri Kovind served the Rajya Sabha for two consecutive terms of six years from April 1994 to March 2006. Shri Kovind served as the 36th Governor of the state of Bihar from August 16, 2015, to June 20, 2017.